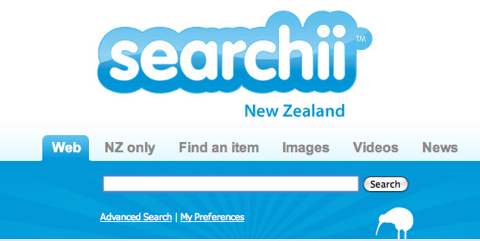 Interesting to spot the New Zealand business interview with new search engine entrant Searchii. Searchii is a new search engine whose stunning point of difference is…. that it comes from New Zealand. Now I take my hat off to any entrepreneur who begins a new venture – it’s hard work and it take a lot of passion. But unfortunately these guys, while possessing passion in spades, seem to have put their sense to the side. Let’s see here – they’re up against an incumbent that absolutely is as close to being a monopoly player as one can be in a situation where competitors exist. Google is king of search, they’re the default place to go to AND you can do New Zealand specific searches via Google if you want to. In the interview they were keen to point out that at least part of their strategy involves the expectation that New Zealanders will use a Kiwi based search engine for their searching needs – sorry but it doesn’t work that way. Google works because they have billions upon billions of crawled pages, they have humongous amounts of processing power, they have geographical spread and they have massive market share – which one of those attributes does Searchii hope to overcome? Anyone remember a few months ago when Cuil was launched – $33million in funding, some of the smartest ex-Google minds and a story that told of doing a Google but better. And where are people searching today? The same place they were before Cuil launched – at Google. Guys – if you have the smarts to build a search engine that works, you should also have the smarts to take some heartfelt advice – don’t do it – competing on search is a bad road to go down. Absolutely. There must be a lot of viable models that they can adapt their business to quite quickly. Look at SLI Systems in Christchurch, they have carved out a really great niche in the area of internal site search, where Google is not so strong. They have a great company with strong growth. Well done to the entrepreneurs for their efforts but they’re stupid to waste money & time developing something they claim to be different from Google (content-based search), while in fact Google is already doing it for the last 4 years or so. Content-search is based on LSI (latent semantic indexing) algorithm and it has reported here, that Google adopted LSI into their PageRank technology as an add-on, a few years ago. There are numerous variants of LSI, where they do differ only in retrieval accuracy/relevancy and also the algorithm speed. Google has moved on from using the standard LSI algorithms to more advanced variants which are more robust in their precisions & recall (ie, relevancy) capabilities. Google has an army of PhDs that do nothing all day, except continuing to improve the accuracy of existing algorithms or inventing new ones. Searchii will end up in a similar situation as iYomu local social networking site, ie, collapsed!! !